Now that we’re in planning season for spring training, you’re looking at the potential dates for your trip—and like many fans, you want the maximum exposure to your favorite teams. Here’s a rundown of optimal travel dates for each Grapefruit League team. Based on our conversations with fans, there are three main types of folks attending games. The first group: locals who just enjoy a game out in the ballpark. The second: travelers who seek great experiences and will spend time driving between training camps in order to see multiple teams in multiple venues. Then there is the third kind of fan: the kind who wants to see their favorite team for the maximum number of games in the shortest stretch of time, the kind who spends most of their time in a single area and who isn’t interested in driving long distances across Florida. In this article we review each team’s schedule and provide the best stretches for optimum baseball: plenty of home games with away games nearby. These recommendations run between three days and six days, with special considerations for rivalry games and events like St. Patrick’s Day. Atlanta Braves: Feb. 28-March 4. This five-day stretch features four home games at Champion Stadium and one away game at nearby Lakeland, an hour drive from Disney World. You could stay onsite in Disney World, use the Disney public transport or an Uber to and from the ballpark, and use the away date as a park day. A worthy alternative: March 17-19, featuring three home games against powerhouses Astros, Yankees and Nationals. Again, you could stay onsite in Disney World, use Disney public transport to and from the ballpark, and not need to rent a car. Here is the full Atlanta Braves schedule, complete with ticket information. Baltimore Orioles: March 8-10. Three awesome home games are on the agenda, with the Red Sox, Yankees and Phillies visiting Ed Smith Stadium. All three games are highly likely to sell out, so this is a case where planning ahead and buying good tickets is essential. Here is the full Baltimore Orioles schedule, complete with ticket information. Boston Red Sox: Feb. 27-March 3. The Red Sox will host four games in five games, interrupted by an away game against crosstown rival Minnesota Twins. So here’s the chance to see five Red Sox games in five days. Just be sure to plan ahead: Red Sox games often sell out, and the Boston/Minnesota games at Hammond Stadium will undoubtedly be packed as well. Here is the full Boston Red Sox schedule, complete with ticket information. Detroit Tigers: March 1-5. Four home games at Publix Field at Joker Marchant Stadium, with visits from the Mets, Braves, and Cardinals highlighting the schedule. As a plus, the Tigers have two games scheduled on the road on March 3, including a game against the Yankees at Steinbrenner Field that is an easy drive from Lakeland. A backup itinerary: A March 21-24 stretch that sees the team with three home games and a night game at Disney World, representing an easy drive from Lakeland. Here is the full Detroit Tigers schedule, complete with ticket information. Houston Astros: Feb. 23-March 1. This seven-day stretch features four home game at FITTEAM Ballpark of the Palm Beaches, two “away games” hosted by the Nationals at FITTEAM Ballpark of the Palm Beaches, and a true away game at nearby Roger Dean Chevrolet Stadium in Jupiter. That gives you plenty of time to hang around training camp and Palm Beach County without needing to leave the area. Here is the full Houston Astros schedule, complete with ticket information. Miami Marlins: March 16-19. Three home games—highlighted by a St. Patrick’s Day match hosting the St. Louis Cardinals—and an away game against the Nationals at nearby FITTEAM Ballpark of the Palm Beaches—gives you plenty of time in Palm Beach County and plenty of exposure to the Marlins near the end of spring training, when the regulars will often be in the lineup. Here is the full Miami Marlins schedule, complete with ticket information. Minnesota Twins: Feb. 23-Feb. 26. Three home games at Hammond Stadium and an away game against crosstown rival Boston Red Sox at JetBlue Park lets you hunker down in Fort Myers for a decent stretch. Here is the full Minnesota Twins schedule, complete with ticket information. New York Mets: Feb. 23-27: With four home games on the schedule at First Data Field and one away game in West Palm Beach—less than an hour drive from Port St. Lucie—this stretch provides you maximum Mets exposure, albeit early in spring training. 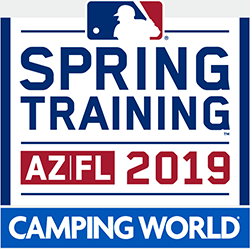 An alternative, coming later in spring training with more regulars in the lineup, is March 21-24, with three home games and an away game against the Atlanta Braves at Champion Stadium in Disney World. Here is the full New York Mets schedule, complete with ticket information. New York Yankees: March 12-16. This five-day stretch gives you four home games, including Steinbrenner Field visits from the Red Sox, the Phillies and the Blue Jays. In the middle of those four games is a Blue Jays away game in Dunedin—a short drive from Tampa. Add in a potential March 17 St. Pat’s game at nearby Clearwater against the Phillies, and you have plenty of very accessible baseball. Here is the full New York Yankees schedule, complete with ticket information. Philadelphia Phillies: March 15-17. Yes, only three home games are in this stretch, but it will make for a glorious weekend of baseball with the Blue Jays, Astros and Yankees in town. The Yankees game, in particular, should be a sellout: New York in town on a weekend St. Patrick’s Day. A backup plan would be Feb. 25-March 1, with four home games in five days and away games in nearby Tampa and Dunedin. Here is the full Philadelphia Phillies schedule, complete with ticket information. Pittsburgh Pirates: March 14-17. Three home games in four days, highlighted by visits from the Phillies and the Red Sox—on St. Pat’s Day, no less. A great weekend to hole up in Bradenton, Here is the full Pittsburgh Pirates schedule, complete with ticket information. St. Louis Cardinals: March 14-18. This five-day stretch gives you three Cardinals home games, one “away” game against the Miami Marlins at Roger Dean Chevrolet Stadium—on St. Patrick’s Day!—and a March 16 game against the Nationals in nearby West Palm Beach. Here is the full St. Louis Cardinals schedule, complete with ticket information. Tampa Bay Rays: March 14-18. It’s hard to pass up four home games in five days at Charlotte Sports Park, with the only away game in nearby Fort Myers—a game hosted by the Boston Red Sox at JetBlue Park. With the Twins, Phillies and Pirates visiting, good tickets that weekend will be in high demand. Here is the full Tampa Bay Rays schedule, complete with ticket information. Toronto Blue Jays: March 14-18. Yes, another St. Patrick’s Day weekend recommendation. But with four home games at Dunedin Stadium, including a home match with the Twins in town on a Sunday St. Pat’s Day as well as a Yankees visit on March 14, Dunedin will be hopping. Remember: Dunedin Stadium is small, and even in a down year, Blue Jays ticket demand is high. Here is the full Toronto Blue Jays schedule, complete with ticket information. Washington Nationals: March 7-13. Four home games and one “away” game hosted by the Astros at FITTEAM Ballpark of the Palm Beaches will give you plenty of baseball in the home camp. There are also to away games against the St. Louis Cardinals in nearby Jupiter, giving you a chance to hunker down in Palm Beach County. Here is the full Washington Nationals schedule, complete with ticket information.